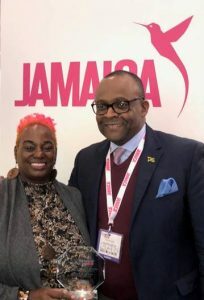 Jamaica’s reputation as a leading epicurean lifestyle destination was again on show, as Jamaica Culinary Tours copped the FoodTrekking Award for “Most Authentic Food or Beverage Tour Operator Experience” at the World Food Travel Association’s Food Travel Innovation Summit. Gastronomy is an important part of the destination’s tourism offerings. Jamaica Culinary Tours was recognized for its role in ensuring that visitors experience an exciting culinary adventure exploring the island’s eclectic cuisine and its rich and diverse culture. This is not the first time Jamaica Culinary Tours has been lauded for its authentic culinary experiences asNational Geographic recently highlighted the Falmouth Food Tour, among the top five Caribbean food tours. The FoodTrekking Awards were founded by the World Food Travel Association in 2016 to recognize excellence and innovation in food and beverage experiences for travelers. Since then, dozens of businesses, destinations and organizations in a variety of categories have been recognized for the fantastic experiences they offer. The awards were held at the Grange St. Paul’s Hotel in London.